A reminder – the ‘topic’ for this coming meeting (Wednesday, April 11) is the Silver Dime Raffle. 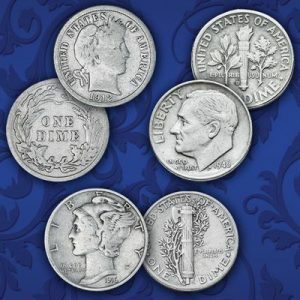 Bring us your numismatically – acceptable U.S. silver dimes. For each dime you toss in the pot, you will receive a raffle ticket – put your name on it and deposit it in the container provided. After the break, one winning ticket will be drawn…and the winner and the club will split the dimes. It can be a large haul! Also remember the scout camp hunt this weekend (and scout’s pancake breakfast) – see the March Probe for details And see the Probe for information on our ongoing gold coin raffle (quarter Eagle coin). Finds of the YEAR Meeting!